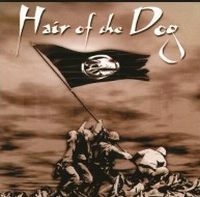 Dirty rock that's the music of Hair Of The Dog. To make sure that they don't have to wait for success too long, they hire one of the most famous producers. Mr. Michael Wagener (his work made bands like White Lion big) was responsible for the production, engineering and the mix. The result is 50 minutes of rock music with metal elements in the vain of the big names like Van Halen, Motörhead and Aerosmith. Singer Ryan Cook doesn't look like he has such a rough voice. John A. Sepetys plays the 6 strings powerful while bassist Boot adds the groovy rhythm. Mike Dupke sits behind the drums and pushes his colleagues with his pounding drums to the limit. 13 songs are on Rise, but if this release will help the band to do that isn't sure. To be honest this musical style is not very up-to-date, the tracks sound like stuff which was released 12 years ago. Even brilliant guitar solo can't make you forget how back-dated this music is. No complains about the quality and the ambition of the musicians, but I think that there aren't many people who want to listen beside some nostalgic ones. I can imagine that there were times where this was trendy and would have been quite successful. These days I wouldn’t bet on the success of Hair Of The Dog..... Sorry! !